What would low population growth mean for Australia? By Ross Elliott - posted Friday, 12 October 2018 Sign Up for free e-mail updates! Australia relies mostly on net overseas migration to sustain its rate of population growth. Our population grew by 1.6% in the year to March 2018, or by around 380,000 people. Of this, natural population growth contributed over a third (144,000) while overseas migration contributed the rest (237,000 people). So what would happen if growing community opposition to population growth – and in particular high rates of overseas migration – meant a slowdown in our population growth rate? The pressure is growing for just such a change in policy, and many in industry fear the worst for Australia – especially property – should our growth rates slow. To try understand what this might mean, I've taken a look at some low population growth countries and also at high growth countries. The data sources aren't consistent from one measure to the next nor are the time periods the same for each country due to differences in reporting times (and data availability) but the results are pretty confronting nonetheless. First, some countries with low rates or negative rates of population growth are listed below. Australia is there for comparison purposes only – our rate of population growth easily eclipses this group. Is there an obvious correlation between population growth and the economy and housing? The answer it seems is no. Japan's population is shrinking, but its GDP per capita is healthy and on a par with the UK and NZ and certainly among the wealthier of nations by this measure. Its housing, relative to incomes, is on average cheaper than the Australian average (for all major markets… Sydney and Melbourne are of course in a league of their own) and Japan is experiencing housing price growth of around 1.46% - even with a shrinking population. Denmark also has a very low rate of population growth but a high GDP per capita and modest housing price growth. The Asian tiger economies like Taiwan and Hong Kong have negligible population growth rates but high GDP per capita and in HK's case, outrageously expensive housing which has been rapidly rising in price. Canada and New Zealand have rates of population growth that are roughly half ours while their GDP per capita is high by global standards. They also have expensive housing markets and high rates of price growth. (Australia's high GDP per capital reflects our high value resources exports with a relatively small population, leading many to argue that a growing population only dilutes our prosperity given resource sector exports are not related to population). So economic prosperity and housing markets are not, on this sample at least, connected to high rates of population growth. There are nations very similar to ours with much lower rates of population growth but which are equally prosperous and with equally healthy (or too healthy?) housing markets. What about nations with higher rates of population growth than Australia? Again, the list is not convincing. Without even looking into their housing markets or economic measures, the list of nations with higher rates of population growth than ours gives little comfort to any link between high rates of population growth and economic prosperity. 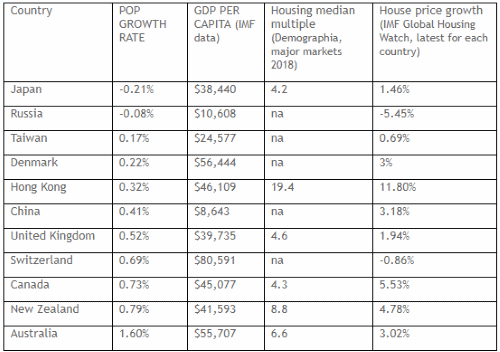 I'll leave you to peruse the list below (which lists all countries with population growth above our 1.6% per annum) and choose where you'd rather live.